I had coffee at a friend’s house recently and she made the best scones I have ever eaten. They were vanilla and lavender and the recipe came from the Alice’s Tea Cup cookbook. I immediately ordered the book from my phone and have made these scones (and other varieties) many times since then. And have also added a trip to Alice’s Tea Cup to my list of must things to eat in New York City. They are cakey and light, and in my opinion, perfect. I have made them with both white flour and whole wheat pastry and I like the way that they both turn out. We are moving soon, so I am trying to use up some of the flours and things in my pantry, so I used wheat for this go around. 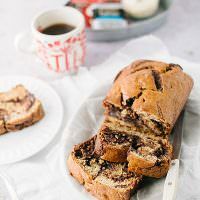 This recipe is a great base recipe. I added lemon zest to mine because, well, we all know how I feel about lemon. You could make a million variations from this recipe. 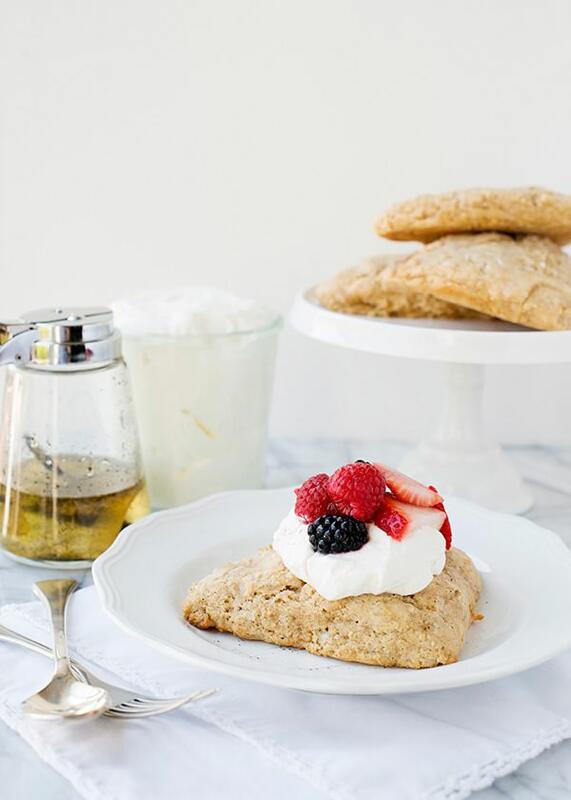 These scones would be a nice addition to your Mother’s Day brunch. I like to make the dough the night before and cover them with plastic wrap on a baking sheet and keep them in the fridge. In the morning, I preheat the oven and brush them with cream and sand with sugar and then bake them off. I think that scones are best eaten when warm from the oven. My friend served her scones with a syrup. I had never had a scone that way before, but please know that now it is the only way that I want to eat them. I also made the Un-Clotted Cream recipe to go with them as well. Real clotted cream is incredible, but way too much effort for me. This cream does the trick. Serve with fresh berries. 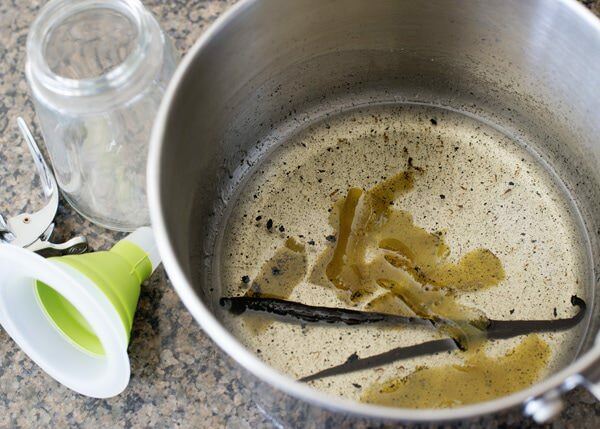 To make the syrup, add the sugar, water, vanilla seeds and pod, and lemon peel to a saucepan. Bring to a boil and cook until the sugar has completely dissolved. Turn off the heat and let cool completely. 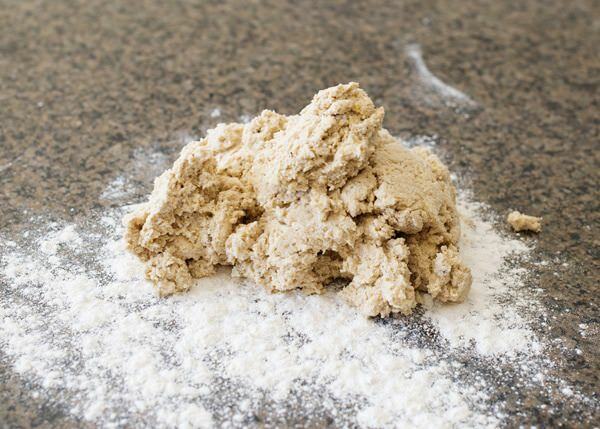 Work the butter into the flour mixture (I use my hands) until it resembles fine breadcrumbs. 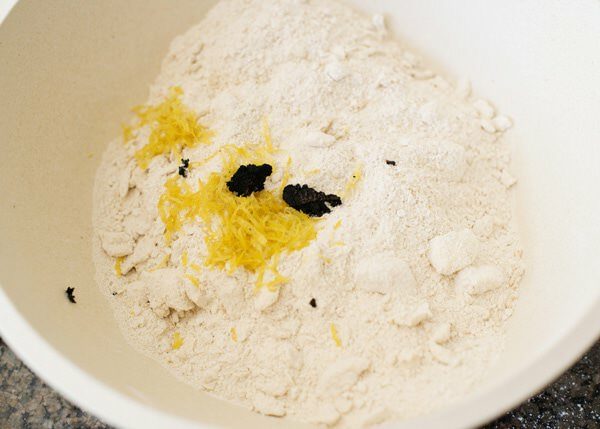 Add the vanilla seeds and lemon peel and combine it into the flour. 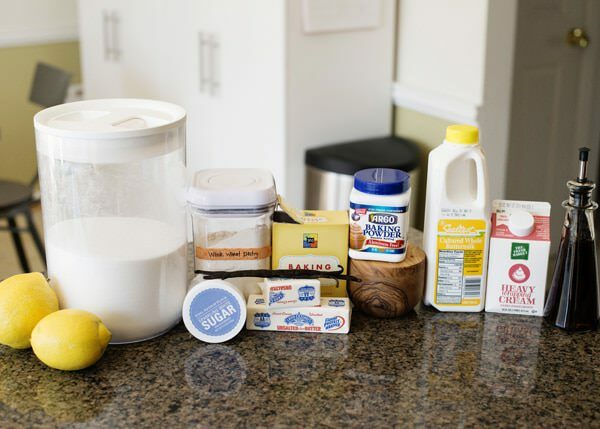 Make a well, and pour in the buttermilk and vanilla. 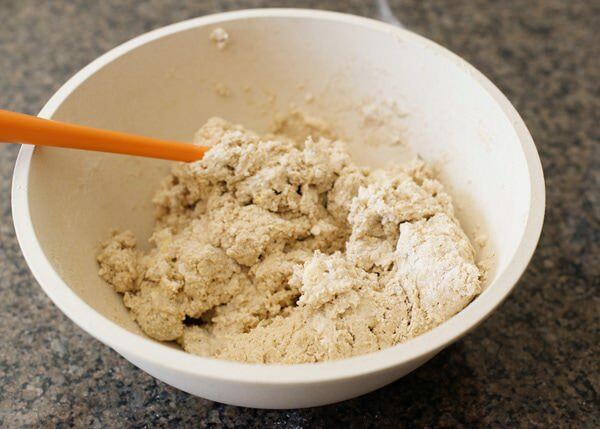 Combine until until everything is wet, but do not knead the dough. This is the most important step. 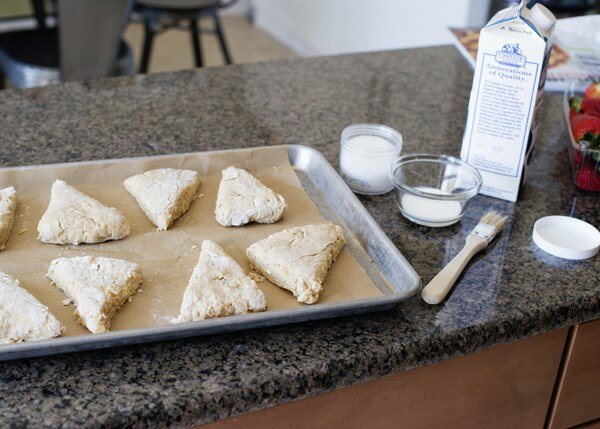 If you overwork your dough, the scones will be tough, not tender and light. 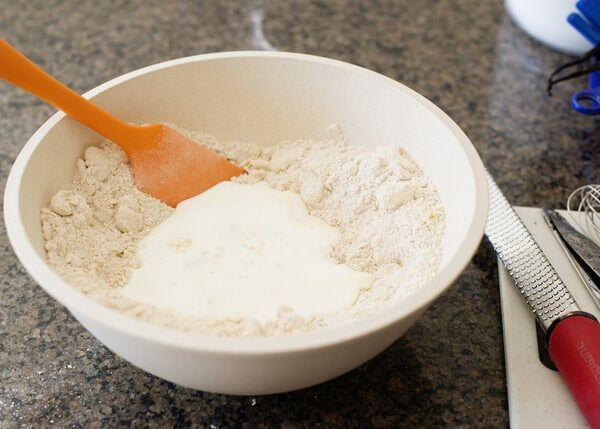 Turn the mixture out onto a floured board. Place on a baking sheet lined with parchment paper. 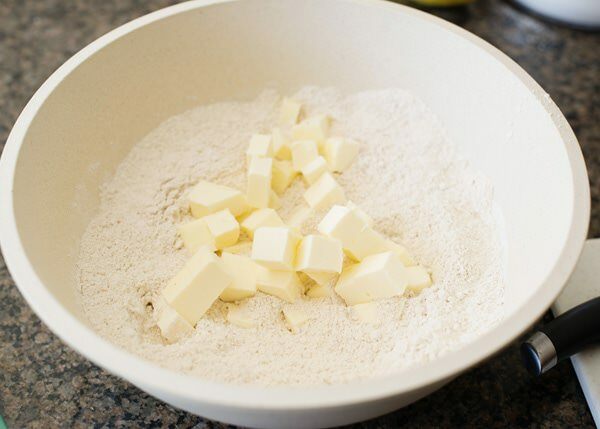 Brush with heavy cream and sprinkle with sanding sugar. Bake in a preheated 425 degrees for about 12 minutes. 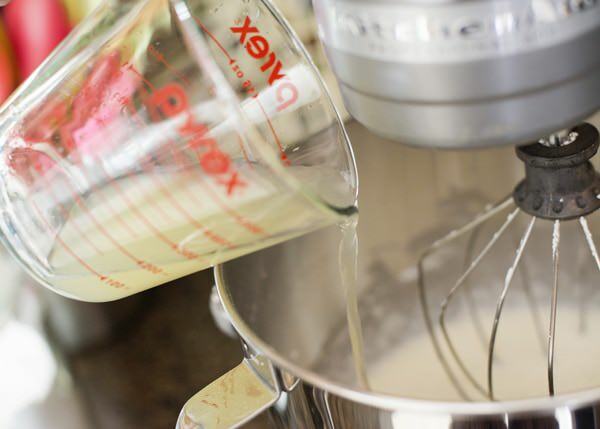 To make the un-clotted cream, add the heavy cream to the bowl of a mixer with the whip attachment. Start on medium speed and add the sugar slowly. Add the lemon juice in a slow stream. Turn the mixer up to high speed (be careful to not splash) and whip until it forms stiff peaks. Keep in a container for up to a week in the fridge. Drizzle the syrup over the warm scones. Serve with the un-clotted cream and fresh berries. 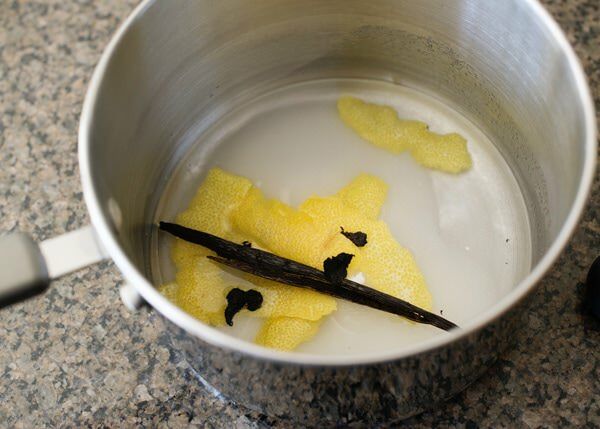 To make the syrup, add the sugar, water, vanilla seeds and pod, and lemon peel to a saucepan. Bring to a boil and cook until the sugar has completely dissolved. Turn off the heat and let cool completely. Make a well, and pour in the buttermilk and vanilla. Combine until until everything is wet, but do not knead the dough. 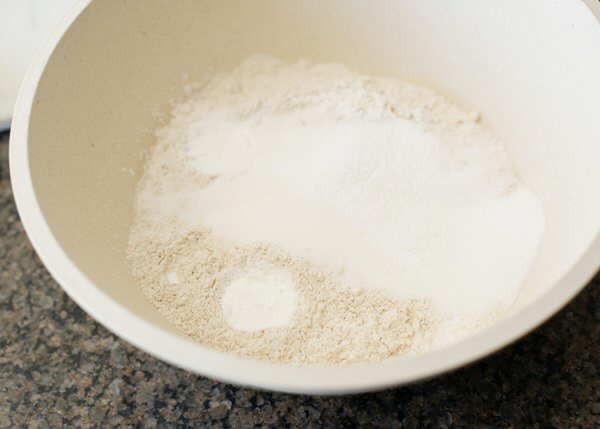 Turn the mixture out onto a floured board. 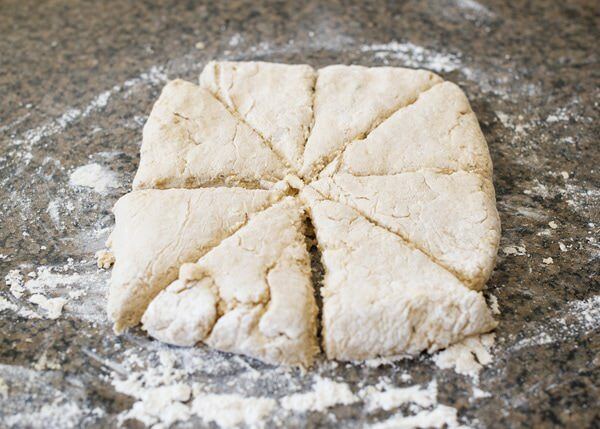 Gather the dough together and pat it into a rectangle shape that is about 1 1/2 inches thick. Cut the scones into 12 wedges. 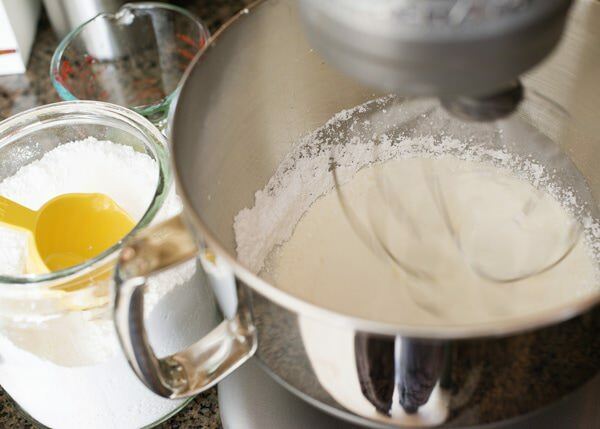 To make the un-clotted cream, add the heavy cream to the bowl of a mixer with the whip attachment. Start on medium speed and add the sugar slowly. Add the lemon juice in a slow stream. Turn the mixer up to high speed (be careful to not splash) and whip until it forms stiff peaks. Keep in a container for up to a week in the fridge. 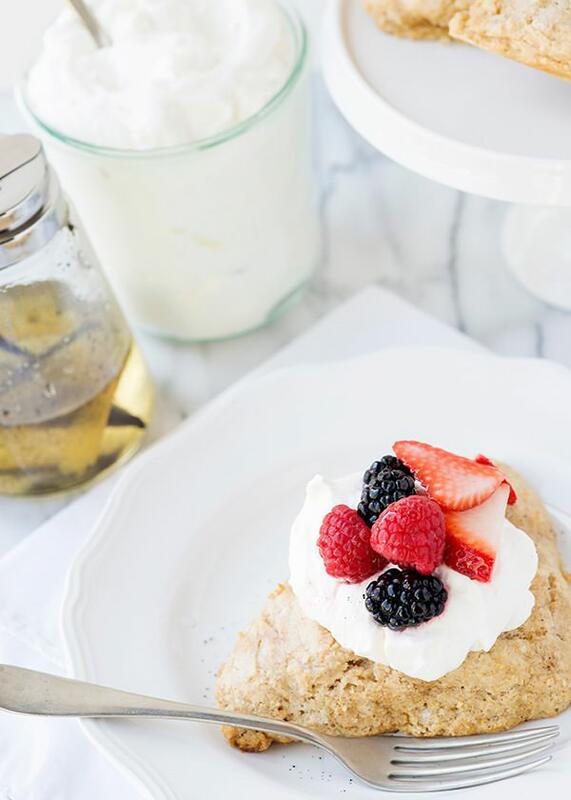 Drizzle the syrup over the warm scones and serve with un-clotted cream and fresh berries. Bree I love scones.. First time I tried they turned out hard and chewy.. These look so good and that cream! Try to touch them as little as possible. Tough and chewy is usually always overworking the dough. I must make these!! And I need that cookbook too. I LOVE the cookbook. So many amazing recipes. 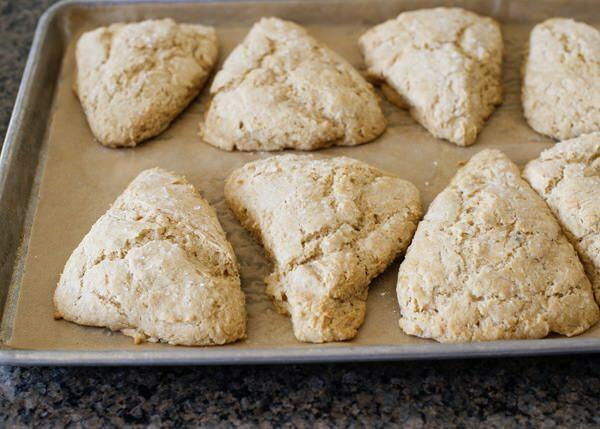 These scones are light and perfect. Not too heavy. 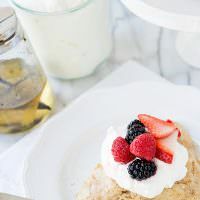 My go-to scone has a base very similar to this and it is always a hit! I can’t wait to try this variation! Yeah! I love this recipe so much. I made a really cute little gift basket yesterday for the teachers. Warm scones, homemade blackberry jam, a cute plate, napkins, and spoons. looks delicious. 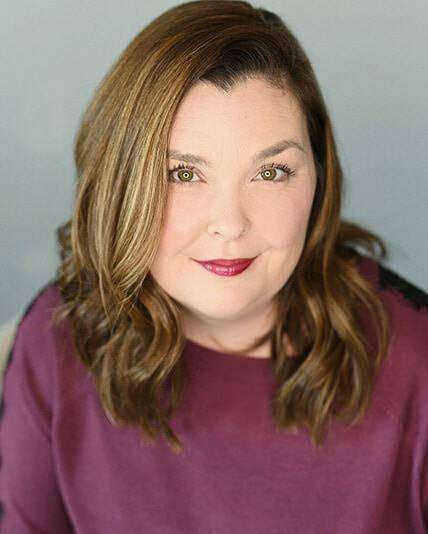 hope you guys had a nice mother’s day! question for you…I had a SLR camera a few years back but didnt use it much and i needed money so i sold it (ha!). anyway— I always admire your photos…I know you have a nice camera but my question for you is…. I want a camera that I can get nice shots out of but also that i could take with me to say… the cruise im going to in june or florence/rome/oktoberfest in september. would you suggest anything to me? at the same time, however, I Want to start taking better food photos on my blog… right now… I use the iphone haha. If I had the need for (yet another) a camera for travel and shooting in the kitchen, this would be it. The negative review I’ve heard is that it is slow to focus, but for what you are looking for, it doesn’t really matter. Food doesn’t move. 🙂 I’d go to a camera store and try some out. looks like a really nice camera… all the reviews on amazing people are raving. thank you so much for your suggestoin. I am going to write this one down and go to a store like you suggested for guidance. its a pretty penny but if i can find a more practical camera for me…i could have it for years. sorry to bug you again. but i was curious what you thought about this camera. I called a store today asking if they had the model you told me about (they did not) and explained what i was looking for and they suggested this. You are not bugging me at all! You can always email me too. I don’t check comments every day, so email is usually your best bet. I read the reviews and they are very mixed. Honestly, I think that the price point is too low. I don’t think that you need to have an expensive camera to take good pictures by any means, but often a $100 camera acts like a $100 camera. If your budget allows, I would look for a higher quality camera.